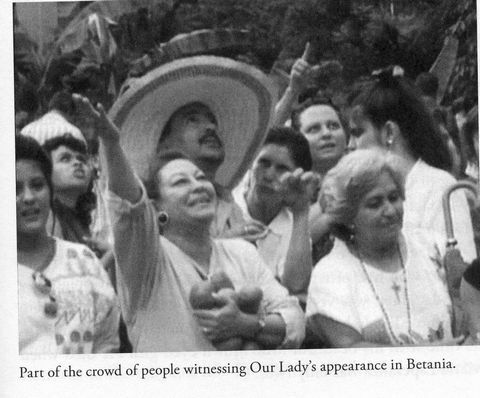 Our Lady of Betania, Venezuela, 1976-1990. It was a gorgeous spring day for a large church picnic on March 25, 1984 for the 108 people in attendance. A grotto nearby with a spring-fed waterfall attracted the active children. 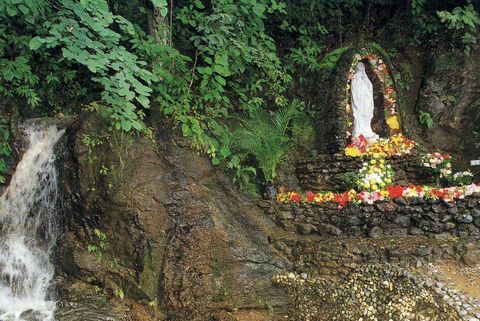 Around 3:00 pm one of the children ran excitedly back to the resting adults to proclaim that the Blessed Mother was appearing to them above the waterfall near the grotto. Word spread quickly, and soon everybody was rushing to see what the child was talking about — and they ALL saw the incredible sight! The glowing white figure of Our Lady stood out against the dark green trees. Many saw a blue sash around her waist, and she was holding the baby Jesus. Many were able to see the clear, beautiful features of her face. She was silent like a statue, causing some to search for tricks or natural explanations. 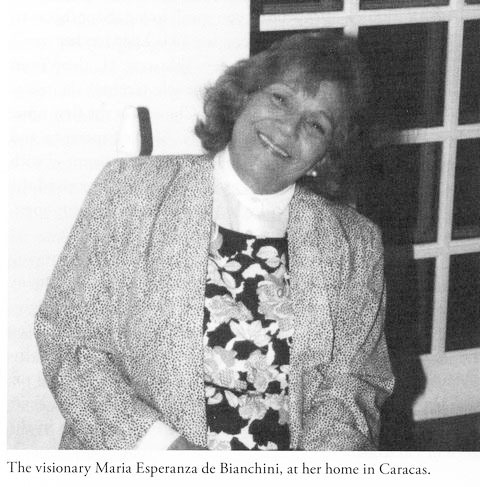 The visionary, Maria Esperanza, with life-long encounters. Fifteen minutes later, she evaporated or “was absorbed into the trees.” But, she appeared six more times that day to the delight of the onlookers. The seventh appearance, right before sunset, was very clear and detailed so that nobody could doubt that it was a strikingly beautiful woman — not a statue or foggy illusion. All of the 108 people at this church picnic saw her clearly — not just children and poor people, but doctors, lawyers, a judge, priests, an army general, and even a few atheists! Maria Esperanza (55) was not surprised at this event, because she had seen Mary on this same farm exactly 8 years earlier on March 25, 1976! 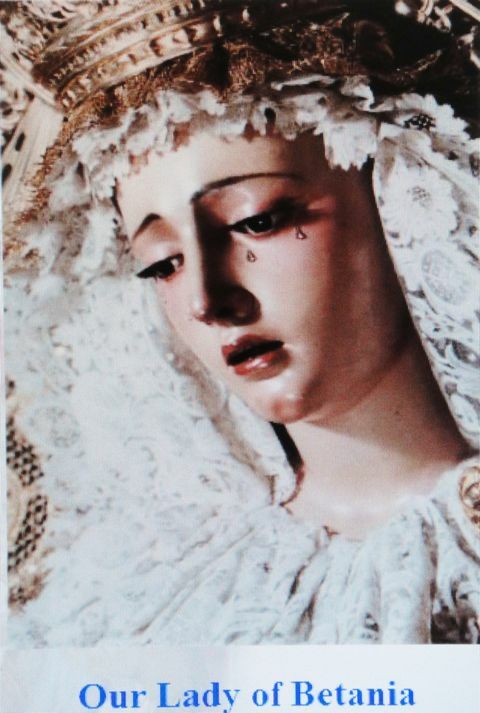 At that time Mary spoke to her and identified herself as “the Reconciler of People and Nations.” She had asked Maria to help promote prayer, conversion, sacrifice, and to have a church built there. Maria had an interesting life after her father died when she was only two. When she was five, she had fears about her mother leaving to go on a trip — perhaps that she would die, also. As her mother departed, she saw a smiling woman rise from the nearby river and toss a rose toward her to console her. She would dress her dolls up to look like nuns and priests. At age 12, she developed such a severe case of pneumonia that doctors only gave her a day or two to live. The young Maria prayed to the Virgin Mary about dying, and Mary appeared to her, assuring her that she would survive in order to serve God, and then told her what medications she needed. 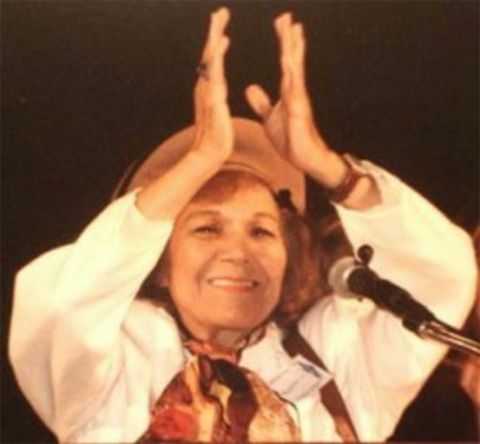 The doctors heeded the heavenly advice, got the medications, and Maria Esperanza recovered. She had several other private apparitions of both Mary and Jesus in her youth. “Then her hands opened up, and I saw what appeared to be rays coming from her hands. 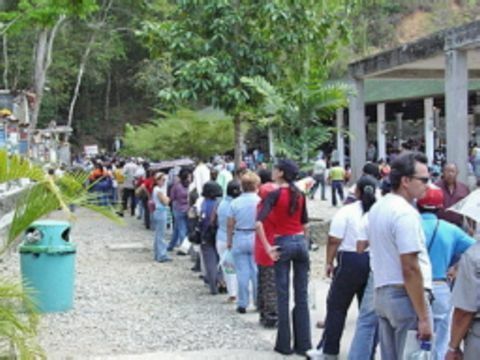 The site of the apparitions in Betania, Venezuela. The day before Pope John Paul II was shot, she told others that she knew that it was going to happen, but had no idea how she could warn him. Then, on 14 different occasions with witnesses watching, a fragrant and beautiful red rose would emerge from her chest above her breasts, causing great pain and embarrassment each time, which she endured graciously. Mary wanted people to notice her and believe her words! The Virgin told Maria that the presence of an unusual, evanescent, blue butterfly would be a symbol of Her presence. Many pilgrims to Betania have had the joy and privilege of seeing this unique butterfly emerge from the waterfall grotto and fly around the church. About twenty others had verbal contacts with Mary. As many as 30,000 people gather on the 25th of each month. On one occasion, Dr. Arrieta, stricken with prostate cancer which had metastasized to his spine, was in attendance. In the morning, thousands saw the sun lose its light, turn green in its center. Then, like at Fatima, the sun seemed to come down toward the screaming, fearful crowds. Dr. Arrieta felt an infusion of heat throughout his body and believed he was being healed at that very moment. Medical tests confirmed he was now completely free of cancer. By 1987, five hundred cures had been documented at Betania. The church deemed these events to be authentic. Each year, Maria Esperanza receives the stigmata of Jesus from Good Friday through Easter Sunday and suffers the pains of His Passion. Others have witnessed a gold glitter fall on them from the sky. Perhaps the greatest miracle occurred on December 8, 1992, during a midnight Mass on the vigil of the feast of the Immaculate Conception. Several thousand people saw a bright light over the Host. Father Otty Aristizabal, the chaplain of Betania, broke the Host in half, placing a small piece in the chalice. But the remaining piece of the Host began to bleed. Miraculously, the blood on this wafer-thin Host did not seep through to the other side. Examination revealed it to be human blood of AB type. This miracle has been preserved in the Convent of Los Teques by the Recollect Augustinian Sisters. On another occasion, Father Rodriguez was holding this miraculous Host in its protective sealed container for pilgrims to kiss and adore when a young and most beautiful child mysteriously appeared out of thin air at his side. The child was reported by those present as having a most holy demeanor and loving appearance. 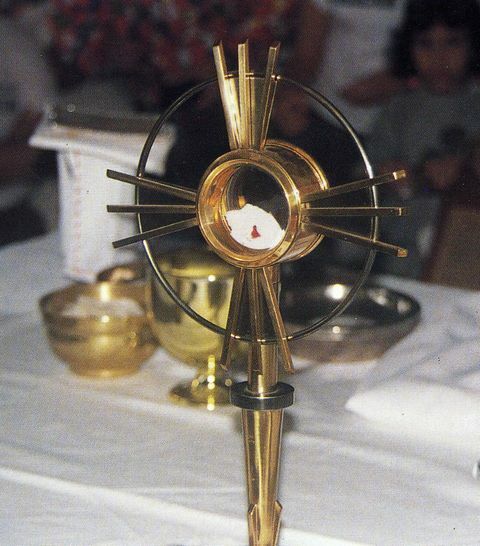 When a visiting priest from Trinidad, Father Cuthbert Alexander, was presented this Host to kiss, the child placed her hand on the priest’s shoulder and then disappeared from view in front of everyone. Everyone is able to see the Virgin Mary at the picnic in 1984. Bishop Pio Bello Ricardo published his letter of approval for these apparitions in 1987. He declared after great study and examination that they are authentic and of supernatural character. The site is declared sacred and approved for pilgrimages and worship. First Apparition: March 25, 1976 – 8:30 a.m.
Second Apparition: August 22, 1976 – 1:30 p.m.
Sixth Apparition: November 27, 1978 – 9:00 a.m.
Eighth Apparition: March 27, 1984 – 11:30 a.m. The apparition site draws crowds of pilgrims today. Ninth Apparition: January 25, 1985 – 3:00 p.m.
Eleventh Apparition: December 8, 1986 – 11:00 a.m.
Thirteenth Apparition: July 6, 1987 – 11:30 a.m.
Fifteenth Apparition: February 16, 1989 – 4:00 p.m. The shrine to Our Lady of Betania at the apparition site. Sixteenth Apparition: February 22, 1989 – 12:00 pm. 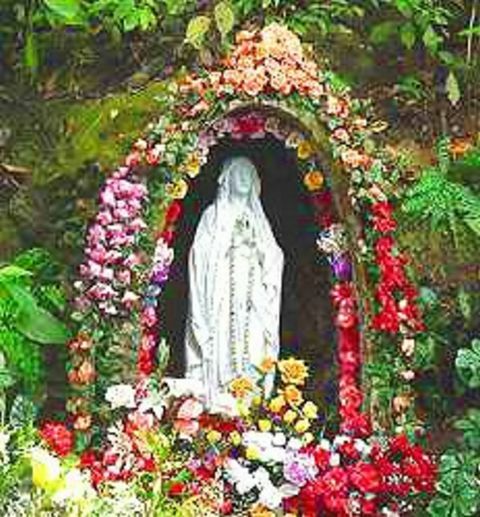 Nineteenth Apparition: April 1, 1989 – 4:30 p.m.
Twenty-second Apparition: May l3, l989 – 7:00 p.m.
“Our Lady of Betania” in Venezuela. 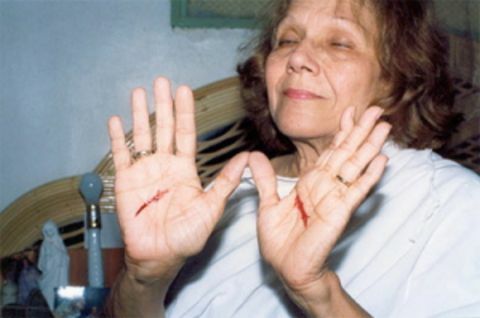 Twenty-third Apparition: May 25, 1989 (Corpus Christi) – 6:00 p.m.
Twenty-fourth Apparition: June 21, 1989 – 9:30 p.m.
Visionary Maria Esperanza experiences stigmata. Twenty-fifth Apparition: July 16, 1989 – 6:30 p.m.
Twenty-sixth Apparition: August 15, 1989 – 5:00 p.m.
Twenty-seventh Apparition: September 8, 1989 – 6:30 p.m.
Twenty-eighth Apparition: October 22, 1989 – 2:30 to 3:00 a.m.
Twenty-ninth Apparition: November 8, 1989 – 6:00 p.m.
Thirtieth Apparition: December 8, 1989 – 6:30 p.m.
Visionary Maria Esperanza shares her messages with the crowds. Thirty-first Apparition: January 5, 1990 – 6:00 p.m.